Paul George scores 30 points as the Thunder get the win over the Pistons, 123-110. Spencer Dinwiddie scores 19 points as the Nets get the win over the Pistons, 103-75. Tied season- and career-high with eight assists in season finale at Sacramento on Apr. 16... Made first start of season (eighth career) and had 13 points and team-highs of eight rebounds (also career-high) and five assists at Utah on Feb. 26... Scored a career-high 15 points (7-9 FG), tied career-highs with seven rebounds and two blocks, in addition to four assists and two steals vs. San Antonio on Feb. 21. Scored 10 points on 5-5 FG in the second quarter to fuel a 26-3 Phoenix run to take control of the game... Had seven points, career-high-tying seven rebounds and five assists vs. Denver on Jan. 19... Had season-highs of 10 points and 23 minutes at Chicago on Jan. 7... Had eight points and tied career-high with eight assists in 19 minutes vs. Milwaukee on Jan. 4... Played in first game since Dec. 3 and posted a +9 in seven minutes at Denver on Dec. 20... Scored eight points (3-3 FG) and had four assists in just 12 minutes vs. Denver on Nov. 8... Recorded a career-high eight assists in just 16 minutes at New Orleans on Nov. 5... Made season debut vs. Utah on Nov. 1 and had two points, five rebounds, one assist and one steal in 12 minutes. 2012-13: Completed his third NBA season by appearing in 52 games (3 starts) split between Orlando and Milwaukee … averaged 2.4 points, 1.2 rebounds and 1.7 assists overall … saw action in 36 games for the Magic prior to the Feb. 21 trade that sent him, Gustavo Ayón and J.J. Redick to Milwaukee … averaged 2.4 points and 1.9 assists in 16 appearances for the Bucks … made his Bucks debut on March 9 at Golden State, and posted his first double-figure scoring game for Milwaukee (and second of the season) with 10 points at Atlanta on April 12 … tied his career high with seven assists at Charlotte on April 13, and established a new career high with seven rebounds at Oklahoma City on April 17 … scored a career-high 13 points for Orlando on Dec. 29 vs. Toronto. 2010-11: Played in 43 combined games during his rookie campaign with Houston and Memphis, averaging 2.3 ppg, 1.8 apg and 1.1 rpg in 10.3 mpg … signed as a free agent with Houston on Aug. 23 … appeared in 28 games (three starts) with the Rockets, averaging 2.6 ppg, 2.3 apg and 1.5 rpg in 11.8 mpg … as a starter, averaged 6.3 ppg, 3.3 apg, 3.3 rpg and 2.00 spg in 27.0 mpg … scored a career-high 12 points on Dec. 10 at Washington and on Dec. 17 at Oklahoma City … dished out career-high seven assists on Dec. 6 at San Antonio … Also played in eight games (five starts) with Rio Grande, Houston’s affiliate in the NBA Development League, averaging 12.5 ppg, 7.9 apg, 4.3 rpg, 1.50 spg and 1.25 bpg in 32.9 mpg … traded by Houston to Memphis along with Shane Battier in exchange for DeMarre Carroll, Hasheem Thabeet and a first round draft pick on Feb. 24 … played in 15 games with the Grizzlies, averaging 1.8 ppg and 1.0 apg in 7.5 mpg … also played in five playoff outings, averaging 0.8 ppg in 2.0 mpg … on Inactive List 22 times and had 16 DNP-CDs. 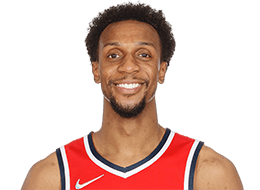 Not drafted by an NBA franchise … signed as a free agent with Houston (Aug. 23, 2010) … played with Rio Grande of the NBA Development League (2010-11) … traded by Houston to Memphis along with Shane Battier in exchange for DeMarre Carroll, Hasheem Thabeet and a first round draft pick (Feb. 24, 2011) … waived by Memphis (Dec. 14, 2011) … awarded to Golden State off waivers (Dec. 16, 2011) … waived by Golden State (Jan. 13, 2012) … signed as a free agent by Orlando (Feb. 2, 2012) … traded to Milwaukee along with Gustavo Ayón and J.J. Redick in exchange for Tobias Harris, Doron Lamb and Beno Udrih (Feb. 21, 2013). COLLEGE Played in 121 career games (91 starts) during his four-year collegiate career at Wake Forest, averaging 9.2 ppg, 5.1 apg, 3.7 rpg and 1.26 spg … became the first player in Wake Forest history to post more than 1,000 points (1,114) and 600 assists (612) during his career ... finished his career ranked second all-time on the Demon Deacons’ list in assists … as a senior (2009-10), started all 31 games, averaging 13.2 ppg, 6.0 apg (seventh in the nation), 4.9 rpg and 1.68 spg, earning Second Team All-ACC honors … as a freshman (2006-07), became the first freshman in ACC history to lead the conference in assists (6.0 apg) and the first Wake Forest player to do so since Muggsy Bogues in 1987.